1.1 How to get to lan ha bay ? How to get to lan ha bay ? 8h00 : Our tour guide and shuttle bus will pick you up at your hotel in Cat Cat Ba island, Enjoy mountainous view on the way to Beo pier. 8:15 to 11:30 : Get on boat and cruising to Lan Ha Bay, visit floating fishing villages where you can see the daily life of fisherman all year around. 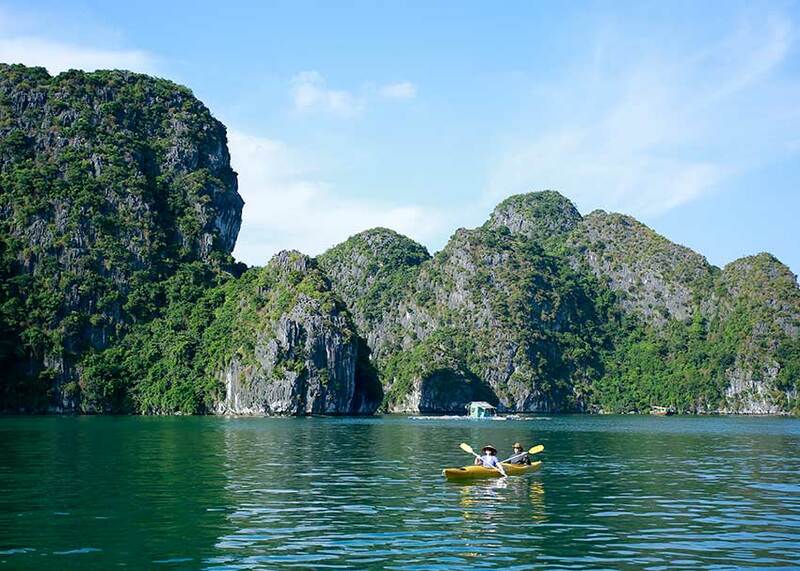 Keep cruising and pass the border to go into Ha Long bay. You will have chance to see a lot of limestone with different shape and size. Boat pauses at Cam lagoon for swimming. 13h30 – 16h00 : Keep cruising to Hang Ca, kayaking through Dark cave, Bat cave and Bright cave. Here you have chance to visit the less-accessed area to get the most exotic scenery to yourself. After 2 hours kayaking, our boat bring you to Three Peachs beach (Ba Trai Dao) to swim, snorkel or lie down on the boat deck for drinking, relaxing and take photographs.